Enjoy the taste of fresh peaches all year long with our delicious Peach Jam recipe. Our step-by-step photo instructions will show you just how easy it is to “save summer in a jar” with local peaches fresh from the orchard. Spread this jam on a hot biscuit or some buttered toast and just step back into summer with every bite. Canning jam is easier than you think, and this is a simple and easy recipe perfect for anyone to try. Peach season has pretty much ended here in the South for this year. But, we can still enjoy that delicious fresh peach taste all through the coming year with our peach preserves and peach jam that we’ve put up for the winter months ahead. I don’t usually make a lot of each as I have a variety of other jams and jellies to enjoy as well, but I do like to have some peach jam in the pantry each year. I have to travel about 35 miles to purchase peaches. We don’t have any local peach orchards within our county, but they are available from some neighboring counties. The Cand0r-West End area of the heart of North Carolina is well known for producing some great peaches. They are also available at many local roadside stands and at the North Carolina State Farmers Market up in Raleigh during peak peach season. I love spooning peach jam into a hot buttermilk biscuit for breakfast. The sweet taste goes well with a piece of salty country ham, eggs cooked over medium, and a plate of grits or hash browns. My oh My….it makes me hungry to just think about it. It’s also good with some peanut butter for a bit of a different taste for those PB&J sandwiches. Of course, what doesn’t taste good with homemade jam right? This particular batch of jam is pectin free. Pectin is used in most jams and jellies to help them “set” or firm up. Some folks seem to think adding powdered or liquid pectin gives the jam a little different taste. With this recipe, you’ll retain the full flavor of your fresh peaches without adding the pectin. It will just need to cook a little longer to get it to firm up. You’ll need to watch it closely to make sure it doesn’t burn as that would be bad. The ingredients are simple, and it’s a quick and easy recipe for saving summer flavors in a jar. Ready to give it a try? Let’s Get Cooking! Homemade Peach Jam Recipe: You’ll need these ingredients. Simple huh? Let’s begin by getting everything ready and setup to process our jam. Gather your jars and the bands for the tops of the jars. Place them in the sink with some hot, soapy water, and give them a good scrubbing. Jars and bands are reusable but you’ll always need new lids for anything you can. Even if you’re using new jars, check them for chips and cracks, and make sure they are in good condition. Wash them good inside and out. Rinse the jars and bands and set them aside for the moment. You’ll also need to setup your stove. 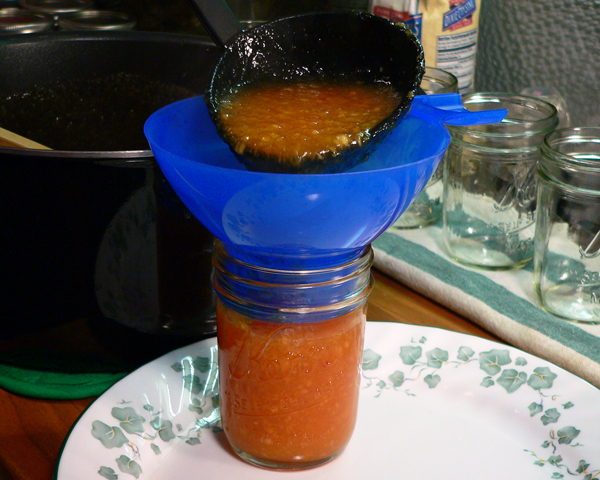 This is my typical setup as seen in most all of my “Canning 101” recipes. On the back left is the smaller pot I use to warm up my lids and bands. More on that later. On the back right is a somewhat larger pot that I keep filled with just water. I like to keep extra hot water in that pot so I can add it to the canning pot as needed. On the front left is the pot that I normally use to cook my jams and jellies in. Then, that big pot on the right is the canner itself. 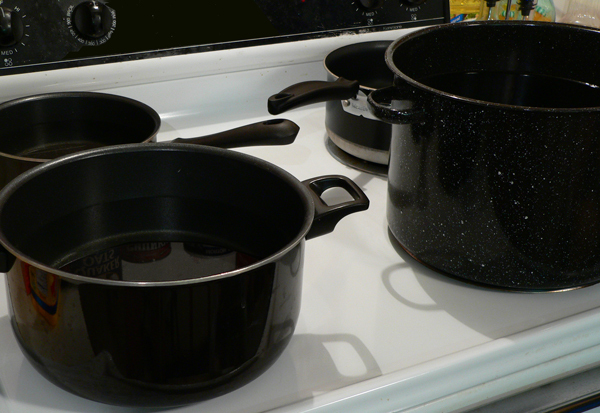 My canner is enamelware, but any large stockpot will pretty much work. I also have a rack to hold the jars that will fit inside. I fill the canner pot about 3/4ths full of fresh water and will use this to sterilize my jars as we begin. These are the NEW lids. I place them with the rubber ring side up in a pot of warm water. This is the pot that’s on my back left burner. I turn the heat down to the lowest or next to lowest setting. 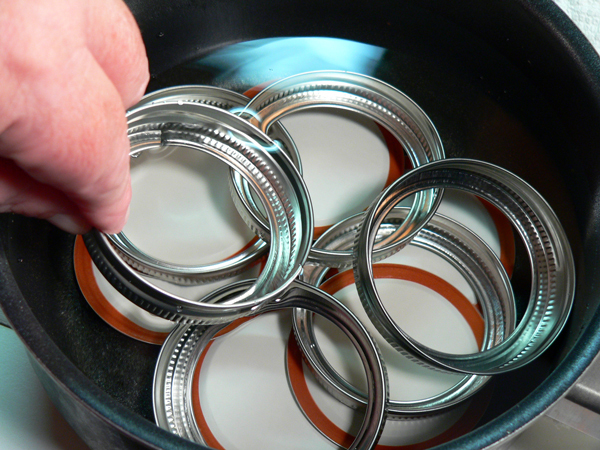 The lids just need to warm up a bit to soften that red rubber ring that’s on them. You never boil the lids as it could damage the rubber ring and cause the jars not to seal. There is a new product out that features reusable lids. They cost a bit more upfront and I guess if you plan to continue canning for years to come, they could be a wise investment. I’ve never used them myself. 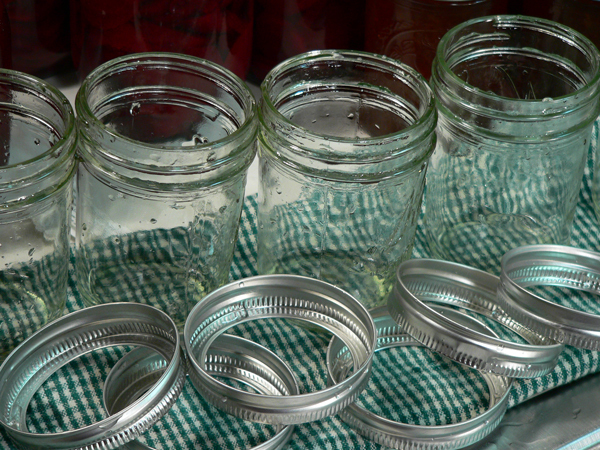 As mentioned, you can reuse the jars and the bands but with our projects, you will ALWAYS need NEW lids for canning. I place the bands right on top of the lids inside the same pot. We’ll let them gently warm up as well. Next, I place my washed and rinsed jars inside the canner pot. This pot will hold seven jars at one time inside the rack. I’ve scrubbed the canner already and filled it with cold water. I just lay my jars on their side in the cold water and will sometimes have the smaller jars laying on top of each other. Many sites suggest that you place a cloth towel inside for the jars to rest on so they aren’t touching the bottom of the pot. The intense heat at the bottom could cause them to break once the canner starts to heat up. So far, I’ve not had any problems with any breakage and I don’t use the towel method. There’s always a first time though. Since I start the jars in cold water and slowly heat them up to boiling, I think that’s the reason I’ve not had any problems thus far. 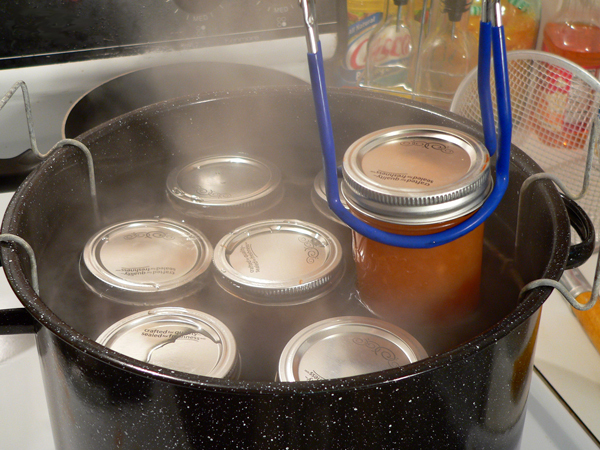 With all the jars in the canner, turn the heat up to almost High and let the jars start to come to a boil. On my electric range, this takes a little time to reach the boiling point. 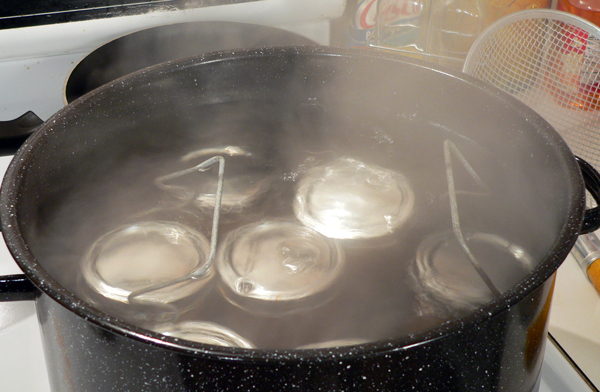 Once the jars reach a low boil, they need to continue to boil for 15 minutes to sterilize them. Some of the newer dishwashers have a cycle for just this purpose, if you have that, go ahead and use it. 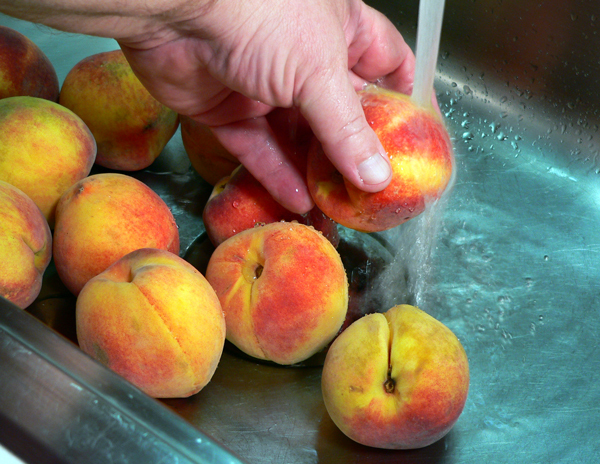 Lightly rinse the peaches under cold running water to remove any dirt of fuzz. 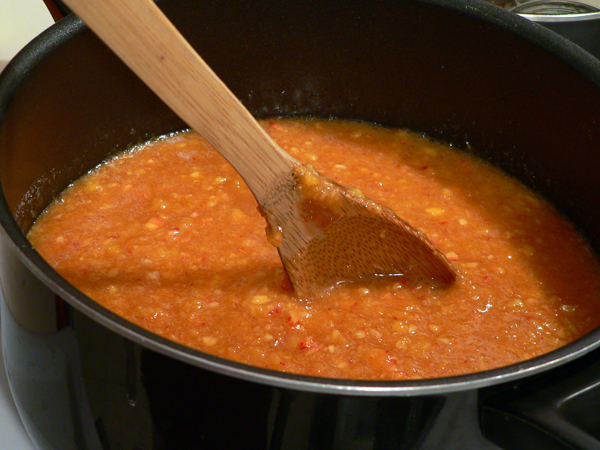 Heat up a pot of water in a large sauce pot. Once it comes to a low rolling boil, drop in the peaches. Let them stay in this hot water for about 2 minutes. After about two minutes, remove the peaches from the hot water and drop them into some ice cold water in your sink. Heating the peaches for a couple of minutes makes it a lot easier to remove the skins. Depending on the peaches, the skins may just pretty much slip off right in your hand. Or, take a paring knife and grab a piece of the skin and easily peel it away. Remove the skin from all of the peaches. Just drop them back in the water until you have them all peeled. You’ll want to remove the skin from each peach. Then, slice the peach in half. You’ll see a wrinkle or indentation in the peach, just slip your knife into that section and run it all the way around the peach. 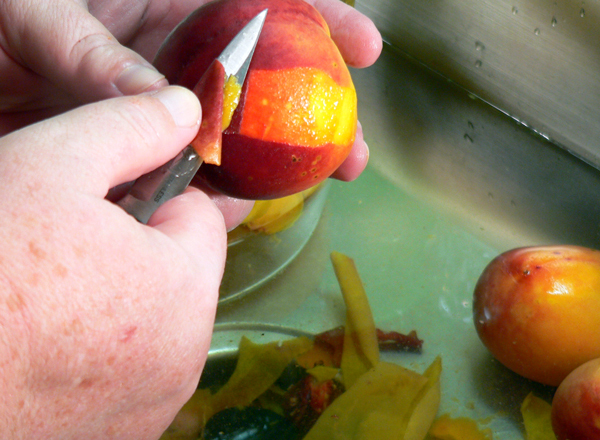 Pull the peach apart and remove the pit or as some folks call it the “stone.” Then, slice the peach into quarters and then cut each slice into one or two chunks. Place the cut peaches into a bowl and add the lemon juice. This will help keep them from turning brown so quickly. Take a spoon and gently toss the peaches around to coat them all with the lemon juice. 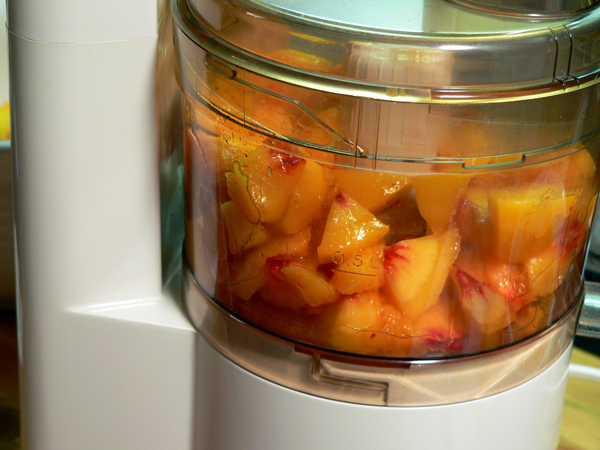 Place the peach pieces in a food processor if you have one. If not, you could just mash them up a bit. Use the pulse mode and pulse the peaches around a bit. You want to leave some small bits of peach and not totally liquefy it. 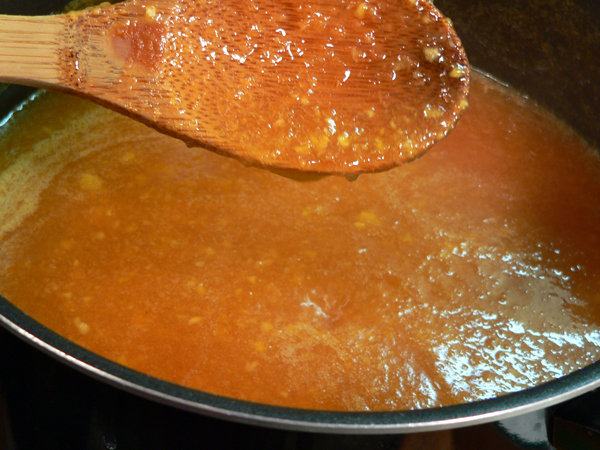 Place a large sauce pot on your stove and turn the heat to the Medium heat setting. Once it’s heated up a bit, add the water. Add in the sugar and start stirring. Continue to stir the water and sugar mixture until the sugar has pretty much dissolved. Add the chopped peaches to the pot and keep stirring. Since we aren’t going to add any pectin, the mixture will have to cook down until it thickens. It’s really easy to walk away and let it burn. I know you don’t want that to happen. Just let it continue to cook and keep stirring until it starts to thicken. While you’re stirring the peaches, it’s a good time to setup your work area. Gather all your tools and be ready to start placing the jam in jars while it’s still hot. The blue items above can be purchased as a kit online or at a large store like Walmart or something similar. The items are not necessary but they make the process a lot easier in the long run. I’ve got a funnel up above, a jar lifter to the right and on the plate is the magnetic wand for lifting the lids and bands out of the warm water. The tool on the right is for removing air bubbles and also has the notches that are measured increments for making sure your jars of jam have the proper amount of headspace. I like to sit my jars in a plate as I fill them. I can get a bit messy with it and it just makes cleaning the sticky stuff up a lot easier for me. You can thank me later. There’s a lot that could be said at this point about making the jam. You don’t want to scorch or burn it but, it does need to thicken up a good bit. You can see this happen by lifting the spoon about 12 inches up out of the pot and letting the syrup drip off the spoon. Start doing this when it thickens up a bit and continue to do it to watch the progress it’s making. Soon, you’ll start to notice that it’s not running off the spoon as fast as when you first started. When two drops of the jam sheet together as you drip it from the spoon, it’s ready to jar up. If you scoop up a spoonful, it should also mound up a bit on your spoon. Another way to test is by placing a saucer in your freezer when you start to cook the jam. Pull this cold saucer out and drop a teaspoon or so onto the cold plate. Tilt it sideways a bit and watch the mixture. If it runs easily, it needs to cook some more. If it runs slowly, the jam is ready. You can also pull your finger through the jam on the saucer to see if it runs back together quickly. You’ll want it to leave that open space separation that you just made. Once that happens, the jam is ready to be placed in jars. If you have any foam on the jam just take a spoon and skim it off and discard it. Now comes the fun part….filling the jars. 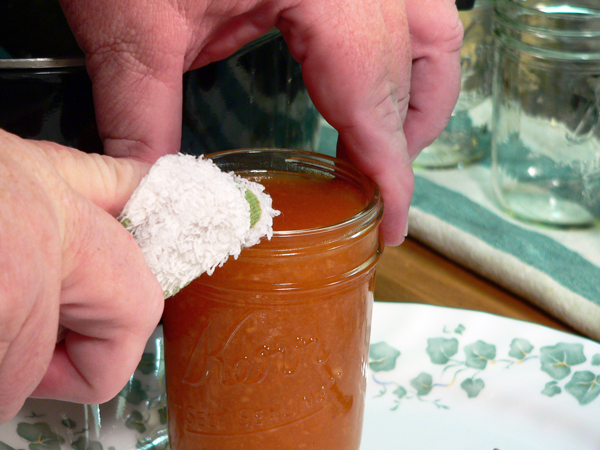 Remove the peach jam from the stove, skim off any foam and discard it…if you have any. Pull a plate up along side the sauce pot and place one of the warm jars from the canner in the plate. Remember, the jars need to have boiled for 15 minutes to sterilize them. Mine usually go a bit longer than that during the preparing the peach process but that’s OK. Take the jam off the stove and use some tongs or the jar lifter to remove the jars from the boiling water in the canner. It’s best to sit them on a towel when you take them out. The jars are hot and sitting a hot jar on a cold counter top could cause the jar to break. Place the funnel in the jar. Use a ladle and spoon the jam into the jars. 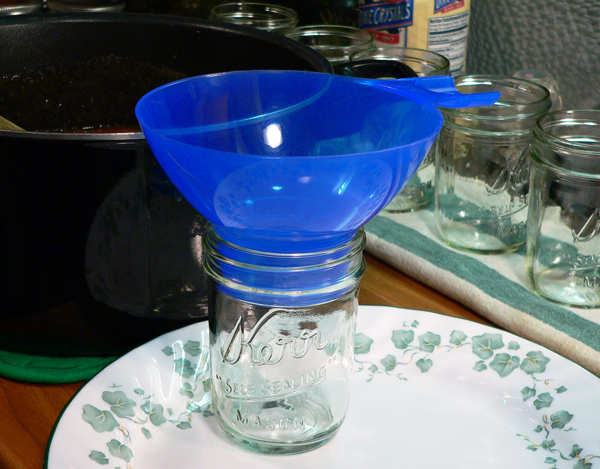 Fill the jar to about 1/4 of an inch from the top and remove the funnel. I normally just take the funnel out of this jar and place it right into the next jar to be filled. Here, I’m using the notched end of my canning tool to check for the proper amount of headspace needed. Headspace, is the amount of space left remaining in the jar after you’ve added the food product. This amount of space will vary in canning, depending on what is being canned. Always consult a tried and trusted recipe for the proper amount of headspace to leave. This is very important to me as I can various items to be placed in our local and state fair competitions. They check it carefully so I have to check it carefully. Still, it’s a major factor in getting a proper seal on your jars once they go into the canner for processing. I could use the other end of the notched tool to remove any air bubbles but, I’ve become accustomed to using these wooden skewers. A butter knife will also do a good job. 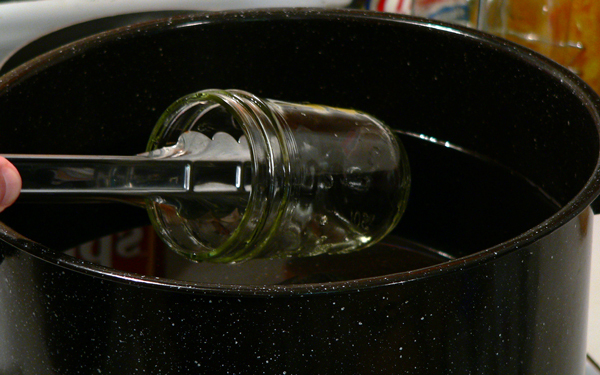 Slip the skewer..or knife…into the jar and gently run it through the middle and around the sides of the jar. The object is to remove any air bubbles that might be inside the jar. You can watch them most of the time as they “climb” their way up along side of the knife and skewer to the top…where they burst. Get out as many as you can. Grab a clean damp cloth and carefully wipe off the thread area of the outside top of each jar. Then, make sure you wipe carefully across the top of each jar. You need to remove any food particles that might have dripped onto the jar as they could prevent a proper seal when the lid comes into contact with the jar surface. Caution though…the jars are hot to the touch. Use the magnetic wand and lift one of the lids out of it’s warm water. Try not to touch the bottom part of the lid with the red rubber seal. Don’t worry about any water left on it, that’s not a problem. Carefully center the lid onto the top of the cleaned jar rim. Hold the top with your finger and pull the magnetic wand away. Use the magnetic wand to lift one of the jar bands out of it’s warm water. 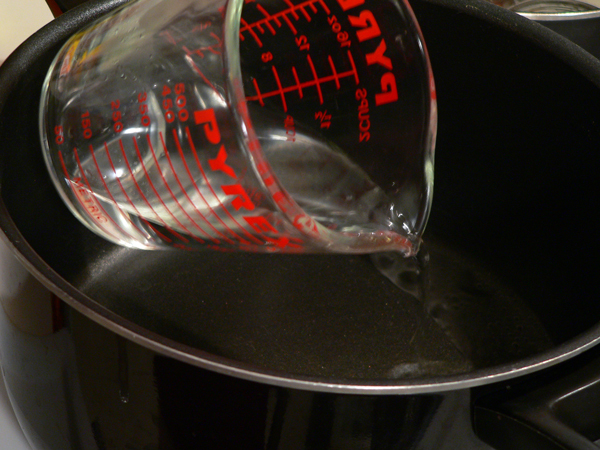 Give it a little shake to remove excess water then, carefully center it over the top of the lid. Screw it down lightly, making sure it’s going on straight and even. Finger tight. All the canning recipes say to tighten the band down just finger tight. That means, just snug it down to the top without using any extra force. Don’t give it all you’ve got to get it tight. Just a gentle snug down and it’s good to go. Repeat this process until all the jars are filled. As I fill one jar, I sit it on another towel until I get them all filled. When all the jars have been filled, use the jar lifter to lift them and place them in the rack inside the canner. The canners come with a metal rack that fits inside. It’s made with a hook in it’s handles that you might be able to pick out in the picture above. 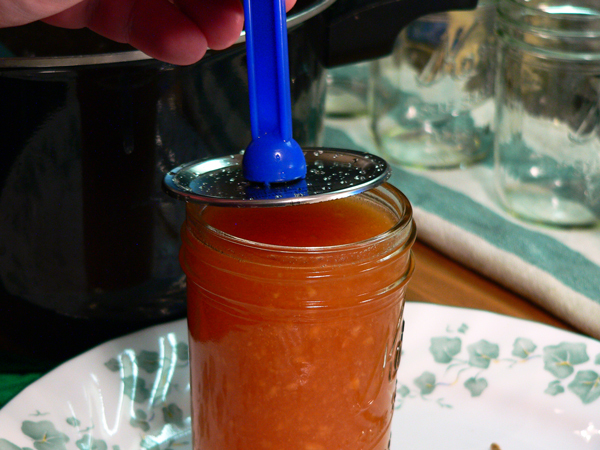 You place the rack in the canner by hooking the handles over the edge of the canner first. Then, you fill the rack with the jars, making sure they are sitting up straight as you go. The rack is divided to give space between each jar. You need them separated so water can flow evenly around them. When all the jars are in the rack, you lift both handles up and off the rim of the canner. Then, you lower the whole rack down into the canner until the jars are submerged. I use tongs to carefully lower the rack as that steam is hot. Be careful. This is also where that extra pot of hot water boiling on the back can come in handy. The jars need to be under 1 to 2 inches of water…again depending on what you’re canning…so be sure to check the recipe out. If you don’t have enough water in the canner, once the jars are down inside, use that hot water from the other pot to fill the canner as needed. With the jars lowered into the canner and, with the proper amount of water over them, watch for the water to come back to a rolling boil. 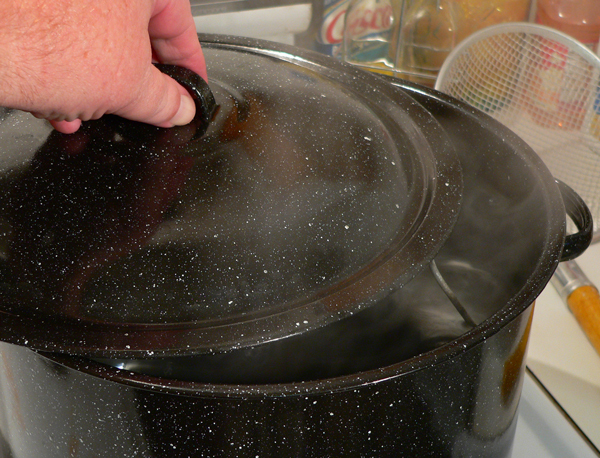 When it’s boiling, place the lid on the canner and start timing this water bath process. The processing times will vary from one recipe to the next and ALSO by the ALTITUDE of where you live. The higher the altitude, the longer the processing time required. Again, the recipe usually includes this information. For me, I’ll need 10 minutes to process these jars of jam. Your’s might be a little longer based on where you live. Once the jars have gone through the water bath process for the proper amount of time, turn the heat off and carefully remove the lid. 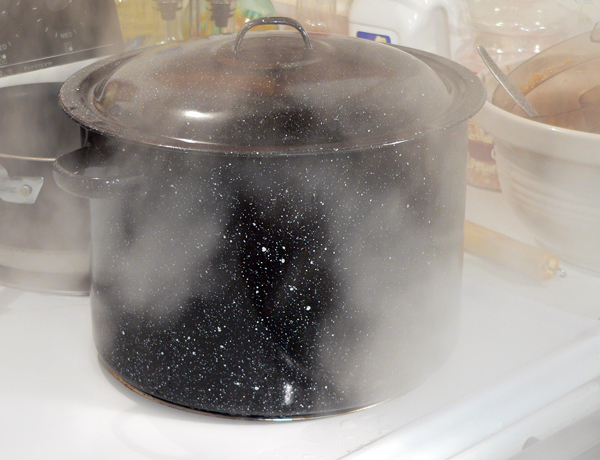 Remember to lift the lid AWAY from you as there will be hot steam underneath and it hurts….trust me on that one. I still forget that part sometimes. Seriously though, the steam can burn you pretty bad. Keep the little one’s out of the way during this process. Now, use your tongs and grab both handles once again. Carefully lift the rack back up just enough to hook the handles back over the top rim of the canner. The jars need to REST here for 5 minutes. You may even start hearing some of them “ping” at this point. That’s a good thing. After five minutes, use the jar lifter and remove the jars one by one. Sit them on your counter top in a draft free location. Also, make sure you sit them on a folded towel. The jars are super hot and placing them on a cold counter could cause them to burst. The jars need to be away from any air vents so they can have time to rest and properly seal. RESIST the temptation to press down on the center of the lid for at least 24 hours. The lids have a slight “bubble” in the middle. As the jars go through this water bath process, the contents inside will heat up. When the jars are removed from the canner, the air inside of the jar gets sucked out and causes that bubble in the lid to pull down. That’s the familiar ping that is so sweet to hear. That’s the sound of a properly sealed jar. Just let them set in this spot for 24 hours to cool. After 24 hours, THEN you can press the tops of the jars to make sure they sealed. If the center bubble spot bounces back up…the jar didn’t seal. The jam inside is still good and you should just place that jar in the refrigerator and eat it first. In the event several jars didn’t seal, the jam can be reheated and processed again. Of course, you will need NEW lids once again to do this but, it could be a way to save your jam instead of throwing it away. You’ll need a little more instruction on that process however that we’re not including here. On the other hand, assuming you’ve followed all the directions and done everything properly, the center of the lid will be pulled down and sealed tightly. At this point, I remove the bands from my jars and place them away for safe keeping. The jars need to be placed in a cool dark place where they can be safely kept for a year or even longer. It’s best to not sit another jar on top of them. Even though the jar may be sealed at the present, sometimes, things happen that cause the lid to loosen and pop open. If that should happen, you would see it and know NOT to use that jar. Something has caused a problem and the food has spoiled and caused a build up of gasses that has popped the lid off. Hopefully that never happens but you need to know about watching for such things. So….wasn’t that pretty easy? It gets easier each time you go through the process. Well, at least it’s not as trying to your nerves after the first time or two. 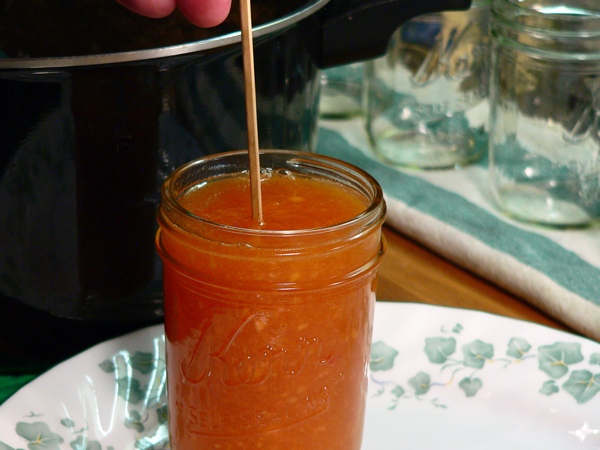 The whole process is pretty much the same each time you make jams or jellies. You’ll just build your confidence more as you continue to work with various fruits and recipes. Then, when winter hits with snow on the ground, pop open a jar of your home made Peach Jam and enjoy a little bit of summer all over again. 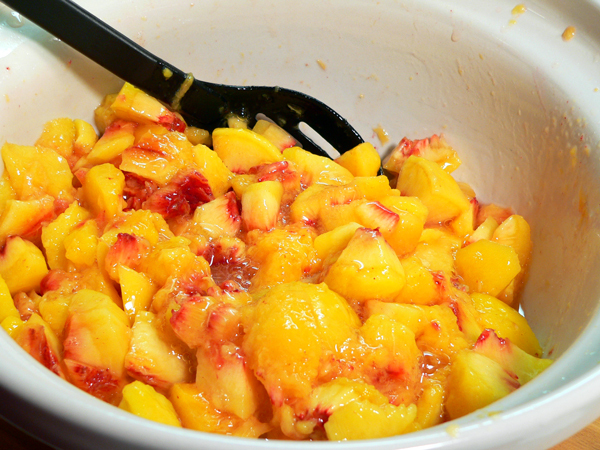 Enjoy the taste of fresh peaches all year long with our delicious Peach Jam recipe. Our step-by-step photo instructions will show you just how easy it is to “save summer in a jar” with local peaches fresh from the orchard. Spread this jam on a hot biscuit or some buttered toast and just step back into summer with every bite. Canning jam is easier than you think and this is a simple and easy recipe perfect for anyone to try. 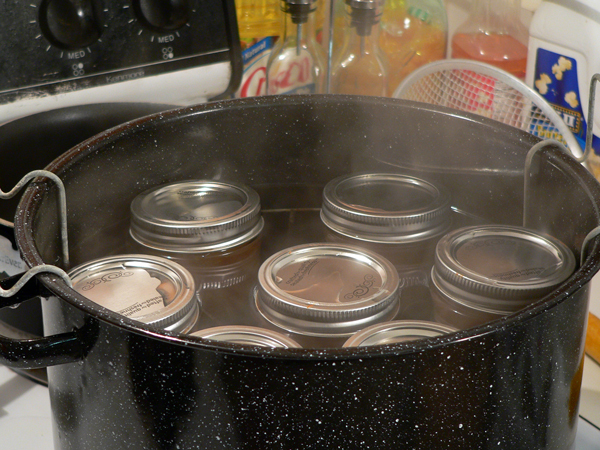 Place jars inside a canner filled with water, bring to boil. Boil jars for 15 minutes to sterilize. 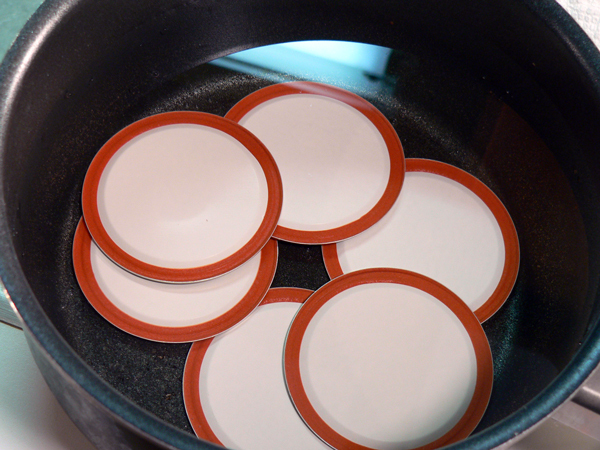 Place lids and bands in warm water, do not boil. Leave until ready to use. Rinse the peaches under cool running water. 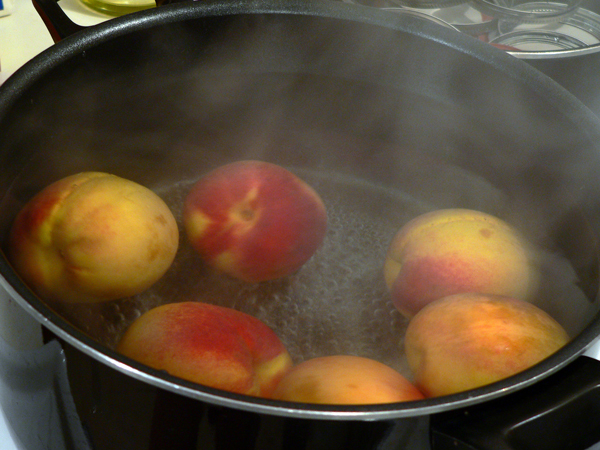 Place whole fresh peaches in a pot of boiling water for 2 minutes. Remove and place in a sink with cold ice water. 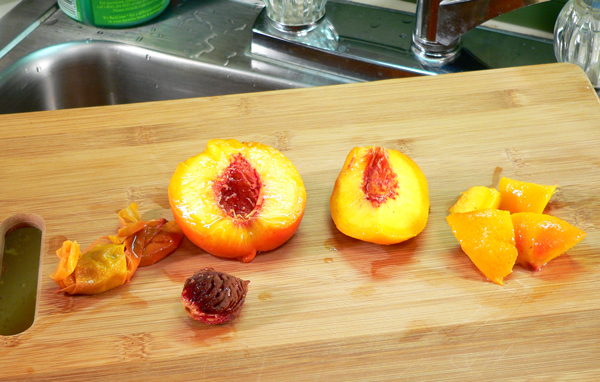 Peel peaches, remove the pit, slice in half, then into quarters. Slice each quarter into 2 or 3 chunks. Place cut peaches in bowl and toss with lemon juice. 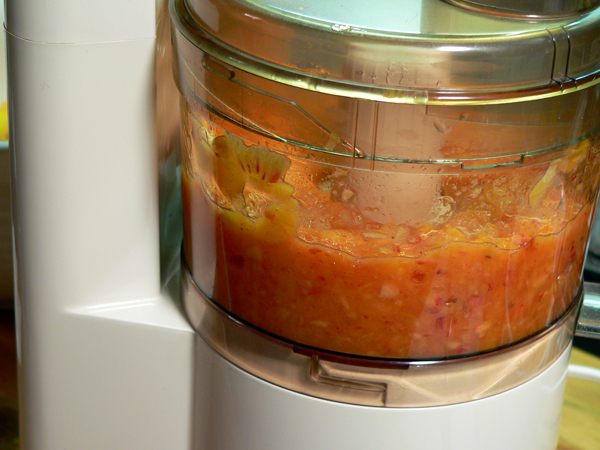 Place in food processor and pulse into small bits but do not liquefy. Place a saucepot on stove, set to medium heat. 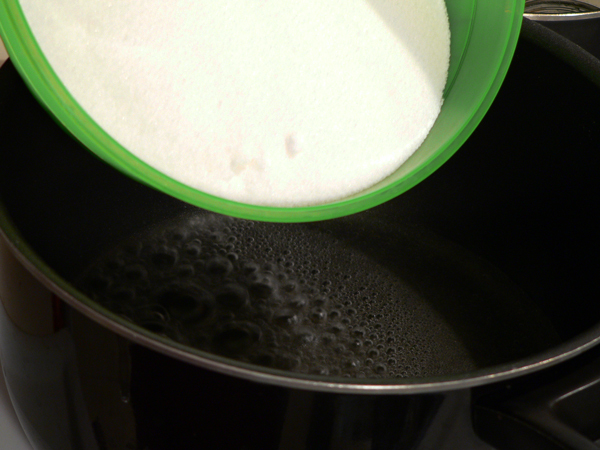 Add water, then sugar and stir until sugar is dissolved. Add peach pulp and continue to stir until it thickens. 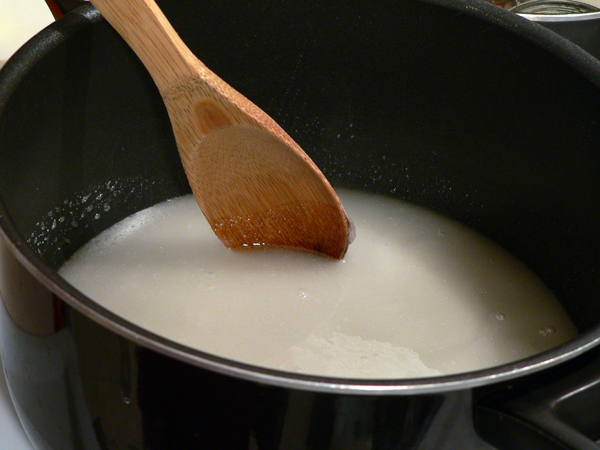 As it thickens, stir frequently to prevent sticking and burning. When done, ladle into hot jars, leaving 1/4 inch headspace. Remove air bubbles, wipe rim, add lid and band. Finger tighten. Process 10 minutes in a boiling water canner or according to the time for your altitude. Remove from canner, and place on folded towel for 24 hours in a draft free location. May be stored in a dark cool place for a year or longer. Disclaimer: This is not an all inclusive recipe for making jam. You should have a basic knowledge and understanding of the canning process before proceeding. Please consult your local Agricultural Extension Service for additional information and available classes. Your Comments: Have you ever tried canning jams or jellies? Were you pleased with the results? What’s your motivation for canning at home? We’d love to hear from you regarding your canning experiences. Canning can be a fun way to share the past traditions of food preservation with the kids and grand-kids. It can also serve as a great way to produce food items that contain little or no preservatives. Mostly, it’s a great way to “Save Summer In A Jar.” Whatever your reasons for checking our recipe, please take a moment and leave us a Comment in the section below. It will only take a minute or two and it’s the only way we have of knowing you stopped by. All comments are moderated so it may take 24 hours or so before your Comment appears on our website. I personally read each and every one and will try to respond to as many as possible. So, leave us your thoughts and check back soon for our reply. Thank You again for visiting Taste of Southern. We greatly appreciate your visit and hope you’ll stop by again real soon. This looks like a good recipe and I’m going to try it, but I have a problem. Here in the UK we do not measure by cups. What size is a cup, is it a coffee cup, tea cup or a bra cup? Our measurements are given in kilos/grams or pounds/ounces and for liquids we use a measuring jug marked in Imperial or metric units. To us a cup is meaningless. Can you add equivalent measurements to the recipes? I’ve been busy canning all kinds of jams this last few weeks. Ive made peach, blueberry, strawberry, and peach preserves. My favorite so far is NAP jam (nectarine, apricot, and peach) Next on my list is cherry preserves. I love pieces of fruit to spread on a hot biscuit or piece of cornbread. My husband and I love to take trips on the roads less traveled. We took a vacation from Georgia to Pennsylvania avoiding Interstates and major highways. What a wonderful way to see this country. I look forward to your Monday newsletter. Thanks for sharing. Made this last year and I will do it again this year. Wonderful recipe, thank you for sharing. Peach jam is the best! I wanted to write that this was my first ever canning experience and all seven of my jars “popped”. Your instructions were wonderfully clear and thorough. I felt confident after reading through this post. I’m so excited about what I’ll try next. Thank you!!! I just made peach jam without pectin. Thank you. Your step by step photos are fabulous. Wish I had had something like this to look at when I first started canning 50 years ago. You mentioned using lids again. What brand are they? I have reused lids for 40 years. Some brands work better than others and some won’t ever seal again. Please tell me what brand you found work the best. Thanks and am looking forward to seeing your new recipes each month. I want to tell you how happy I am to have found your site. We made several jars of this peach jam with fresh Georgia peaches, and it is HANDS DOWN the best jam I’ve ever had. I could eat it right out of the jar with a spoon. I don’t even need toast! I also can’t wait to try your other recipes. The step by step instructions were VERY helpful. Thank you for taking the time to produce such quality content and for sharing your family recipes! Although I have cooked many different things in my life I was never confident enough to attempt canning especially after my Moms many disasters. However I acquired about 10 lbs of fresh peaches that were not going to last long so I sucked it up and headed for supplies. Halfway through this recipe and process my confidence wavered until my beautiful mess started to thicken however I still wasnt sure about anything I was doing. I got the jam in my sterilized jars and put the lids and rings on then into the water bath. and then the nightmare hit my pot barely had 3/4 of an inch from jar top top to pot top but I had no choice but to fill the pot to the brim and turn it to boiland see what the results would be. As it was 10:30 p.m. and the closest Walmart is 30 miles away. I had to keep adding water to the pot and added and extra 10 mins tothe process then moved the pot to cool and then I heard it the sweet sweet popping sound of 7 beautiful jars of peach jam !!!!! Now its 2 days later and I have 20lbs of nectarines and 10 lbs of mangos and a fresh stock pot to get me through the weekend !!! Thank You for this recipe you are truly a canning master. I had a few peaches and apples left over and didn’t want them to spoil so that is how I stumbled on this site. I’m glad I did! Reading through this was very insightful and extremely helpful for a first timer. Not sure how successful I will be but I will keep trying till I get a ping! I am going to try to mix the fruits I have and see if it will turn out alright. I’ve made apricot jam before but never had detailed instruction like this. Hopefully I will get a chance to come back and let you know how things turned out. Thank you in advance! Batch no. 1 finished. It is wonderful and yes it tastes like summer. I going to be stingy and keep it all. My mother and I tried this recipe. It was our first attempt at canning and we were so proud of the results! Thank you for the recipe! I featured it on my website! We canned some nectarines for the first time last year & my sister mistyped the amount of sugar to add so they are very sweet. We were wondering if we can somehow use them but add fresh nectarines to them to make jam and if so how do we do that? Any tips you have would be greatly appreciated. My husband thought we could just throw them in with the new nectarines we would use and boil them down, I didn’t think that would work. They’d still be very sweet right? Thanks! Thanks for this recipe, I have been wanting to try a pectin-free preserve an I love the simplicity of ingredients. I am using beautiful New Mexico peaches and look forward to “summer in a jar” this winter. I have some fresh peaches from the shore of Lake Michigan. I’d love to make a smaller batch of peach jam….can I half the recipe for the peach jam without pectin and still have the jam set up properly? Thanks for the great recipe..I’ve never made jam without pectin and am eager to give it a try. I have soooo many peaches this year and was going to make a double batch- why is doubling the recipe a problem? (I’ve made this jam for the last couple of years and it is great. And the detailed, step-by-step instructions are really, by the way- thanks!). This is a great recipe. I did a little tweeking. First, I didn’t want to process it, and secondly, having leftover peelings from my canned peaches, cooked them up and added them. And, I cooked them close to 40 minutes on low. Anyway, I will definitely be coming to your website regularly. Thanks for your contribution in cooking. YUM! I have canned for many years but normally avoid jams as they can be finicky. Your instructions are clear and precise. The pictures are so helpful . So thank you for your sharing your recipe! Thank you for the pictures in the step by step directions!! This was my first time jarring peaches and it was a huge success thanks to this website! I am already excited for my trip to the farmers market this weekend so I can jar more yummy things! Good, clear instruction for making peach jam. For context, I retired 15, January this year and am cooking up a storm. I find cooking most satisfying. Canning is my next venture. 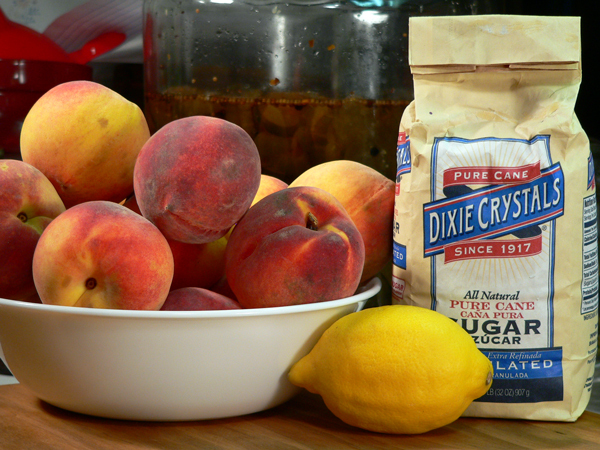 This peach mix will be my first attempt. Thanks for your inspiration for this venture. I checked out the pig cookers. They look well built. Maybe my next venture. AWESOME. Thank you for these prefect step by step directions. I went peach picking and needed to find a way to store them. Great job. I can’t wait to try this soon. Once the jars go through the water bath and you leave them to set for 5 min. then at one point you remove the rings to a safe place. Why? I’m new to canning, but I’ve never heard of removing them. Maybe when you are ready to eat the contents. I was under the impression it helped to keep them tight. I thought this recipe was super helpful! I’ve never canned anything before and was given a bunch of free peaches so I thought I’d give it a try and it was super easy and delicious! The step by step directions were super helpful since I’ve never made jam or anything before and it tasted better than anything I’ve bought at the store before. Can you put some pectin into the jam to thicken it faster? Hi Steve, well it has been some time since I have written a line or two , but we must be on the same wave length. I was looking for a great peach jam recipe, and here it shows up !! 🙂 Loved your Pictures, and especially the Quaint little town. Love it. well keep sending recipes and stories as I love them each and every one. Take Care, and be Blessed. I have been making strawberry jam for years now with the “overnight” soak method. It has less sugar than most recipes and the final product is more like a spread than a jam, but it is very delicious with a great berry taste. The process involves using equal weights ( I use a food scale),of sugar and berries and letting is sit over night after a quick cook. The next morning I finished the cooking and put it in jars and process it. I have not gone into the whole total recipe here but it is easily found online. It also uses no pectin. I have had good luck with it ALMOST always, but occasionally I don’t cook it long enough and have to redo it. The down side is that it takes two days to complete. However, for small batches it is ideal, depending on what fruit is available. Then I don’t process it. I am going to use your Peach Jam recipe as peaches as prime now and would like to try something different. Also I have a neat project for my husband to make me one of those nifty magnetic wands. 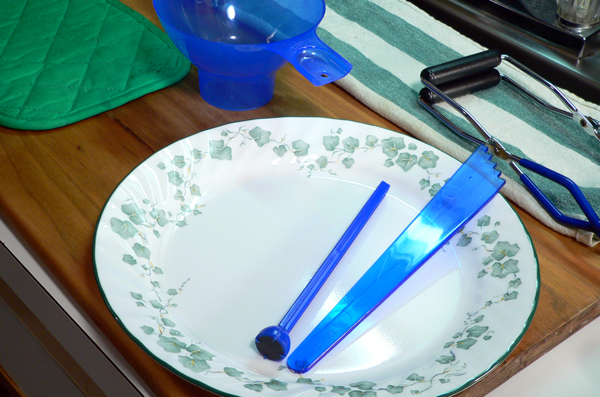 A great idea and would work much better than the tongs I normally use. We have plenty of magnets around and some Super Glue to attach it to a wand of sorts. I am looking forward to some Peach Jam this winter (well, in Southern California it never really is winter) but it gets chilly. Thanks. Steve, reading your articles on water bath preserving inspired me to try my hand at preserving. So far I have made blueberry and strawberry preserves. They are absolutely delicious. Have shared with family, neighbor and friends. They all want more! Will definitely oblige them and also will try my hand at your peach jam recipe. So happy that I came upon your site! One question – how long do these last once opened in the fridge? I know you said it’s a year shelf life if unopened, but curious how long they are good kept cold in the fridge. Do you think I could half this recipe? Would the cook time remain the same? Hands down the best site I have seen for basic canning tips and of course the recipe. The photos were so incredibly helpful. Very often instructions are just a lot of text; leaving me to wonder if I am doing it right as I am a first-time canning student. Thank you so much. This was my first time making jam. Your directions AND photos were very helpful so I chose to follow your recipe. Everything went off without a hitch and the jam is delicious. Thank you so much for helping me get started. I am looking forward to making a second batch tomorrow! I am new to canning and want to try your recipe for my wedding as a party favors for our guests. Would you be able to tell me approximately how long the peaches with sugar should be cooked? Thanks! How many jars and the size do I need??? This is my first year making jam/jelly. I made 9 quarts of Concord grape jelly using 4 cups grapes and 3 cups sugar. Once mixture started boiling I boiled for additional 20 minutes. I have apple dripping now for jelly. Planning to do peaches up tomorrow. My question for you is can I do plums the same way as peaches? My 4 year old granddaughter loves watching me. She knows everything is hot but she is learning by watching and eating. No better way to have wholesome food without additives and preservatives. Thank you. Hi Kelly, Thank you for your question. I’m thankful you’ve found Taste of Southern and that you’re getting into home food preservation with your jams and jellies. Keep up the good work. You don’t say if you’re looking to make plum jam or plum jelly. The process is pretty much the same, you’d just need to add sugar based on how many plums you’re working with. I’m sorry that I don’t have a step-by-step recipe for making plum jelly. I made some several weeks back using the Ball FreshTECH Jam and Jelly Maker that I received. It turned out well, I just didn’t take photos of the process. Maybe next year. I suggest you consult your local cooperative extension service for more information on making the jam or jelly with plums. You could also purchase the Ball Guide to Preserving, which I use all the time. It’s a great book with tested recipes… that work. Thank you so much for this post! This was my 3rd time making jam, and it turned out perfect! My last peach jam experience used pectin and it was, shall we say, less than successful. Your instructions and pictures made this time around much easier, and I couldn’t be happier with the results. It took a really looooong time to thicken up (man, that was a lot of stirring) and the yield was a little bit less than I was expecting, but the jam itself is so, so yummy. My plan for dessert tonight is peach pound cake with this jam spread on top. This is a recipe I will be coming back to over and over. Thanks again! I just finished making a batch of the jam. I will test a bottle in a few days. I estimated the weight and had the exact number for seven 8 oz. jars. Due to size differences my count would vary from others. I used my bathroom scale to get the weight. Only complaint is the time estimate. Took me almost five hours from start to finish. Just a few more comments: I like to add some kind of acidic juice because I think it offsets the almost cloying sweetness of peaches, especially with added sugar. I’m about to make a batch of peach-rhubarb jelly, because I think rhubarb is a great surprise substitute for boring old lemon juice. However, if what you’re trying to do is keep fruit from browning, there’s a much better alternative: Vitamin C. If you smash up a 500mg Vit. 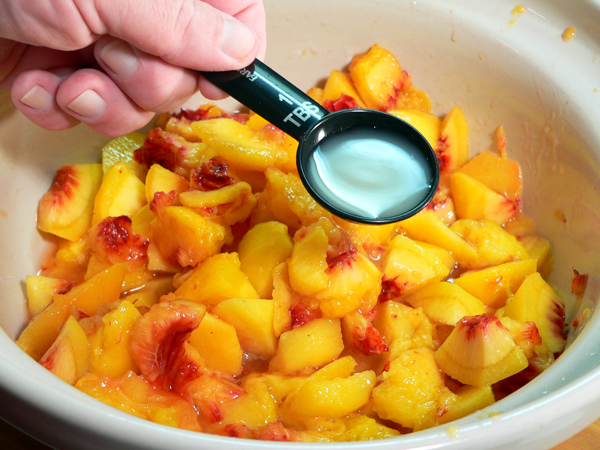 C tablet, dissolve it in water, and throw that over your peaches, it will absolutely eliminate browning. I once dipped apple and pear slices in C water and served them at a lunch. Twenty-four hours later they were still untouched by browning, even though they had NOT been refrigerated. Plus, unlike lemon juice, vitamin C does not change the flavor at all. Although it’s harder to find, I get C as a powder, and use it for just about all my fruit canning work. The commercial product “Fruit Fresh” is just a rather expensive way to buy Vitamin C powder; another name for C is ascorbic acid. You should be able to find ascorbic acid at any place that sells home making wine supplies as it is used in that process. I tried this recipe yesterday and love it! Very good on toast. Also, your pickled beet recipe turned out perfectly! Thanks ever so much for these:). And now on to the buttermilk pie – it sounds delicious. I am planning a 75th birthday party for my Mother-in-law and I wanted to make special favors and this is perfect. It came out soooo good. So everyone will be getting a 1/2 pint of the jam. I haven’t canned in years and I can tell you my mom was watching over me tonight.She would be proud. Thanks again. This is a fabulous recipe! This is the first time I’ve ever made jam and it turned out perfect! I’ve been pouring over tons of recipes looking for one without pectin and the right amount of sugar. I love the step by step pictures- really helps out a lot. I’m making blueberry jam next. I can’t wait until fall to make some apple butter! Thank you so much! Hi Nikki, Thank you for your comments and compliments on our recipes. Congratulations on making your first jars of jam, I know you’ll be making lots more things now that you’ve taken that big first step. Keep up the great work. Hi Steve! I have made your blueberry jam and this peach jam (I threw in a handful of cherries too) and the it was a huge hit. So much so that my father in law wants another dozen jars of it. Which leads me to this…can I use pint jars instead? And if I do how would that change the amount of processing time needed? Also, would doubling the recipe cause it to not set properly? I’m new at this! Help! Hi Amy, Thank you for the question. You can use pint or quart jars if you’d like. Just don’t double the recipe when doing it. Most jams and jellies are made in “small batches,” and all the books are against doubling of recipes. It could certainly cause you some problems in setting up properly. I hope this helps. Pint jars, as you’ve guessed, would require a longer processing time. Contact your local extension agent and see if they have that information. If not, then the safest thing to do would be just use more little jars. For me, the best reason not to try making a double batch is that you need to make sure you have a pot big enough to safely handle a double batch. Sugar raises the boiling point of jam well past 212º F, so if your pot of jam boils over or splashes onto your hands, it will *really* burn! Do you really want to be wrestling with half a gallon of boiling hot goo? Thank you so much for the beautifully crafted recipe, forgive me if this is a base question but is boil-canning necessary for all jams, my cookbook gives the impression that rasberry jams and strawberry jams only need their lids boiled and then placed on, contrary to your method presented. I would like practice the correct method for all of my canning, and your method seems the most thorough, would you recommend boiling for all types of jams? Also it does not look as if that is a pressure caner, am I incorrect, when would one use a pressure caner, with jams? Hi Rachel, Thank you for your question. I always use the water bath method when making jam and jellies. I follow the guidelines listed by the North Carolina Cooperative Extension Service, the USDA, and the Ball Blue Book of Preserving, just to name a few. They all will suggest that jams and jellies be water bath processed. Better to be on the safe side at all times. I hope this helps. Thanks for the recipe. I really didn’t want to use pectin and this was the perfect recipe. I made two batches and am going to try blueberry. Thanks so much. 1. Do you not have to sterilize the other tools? 2. Why do you take the band off the jars at the end? 3. What is consistency of your jam? Since no pectin, some say its a little more runny, and not as flavorful since you have to cook it longer. (the conspiracy theorist in me says its just the commercial pectin producers putting that out there, LOL)Maybe Ill make my own. By the way… my altitude is 17.09 meters! Hi Adia, Welcome to Taste of Southern. I’m thankful you’ve found us, and I appreciate your questions. (1) I do not sterilize the other tools. They aren’t coming in direct contact with the food, so it’s not necessary. The only exception would be the bubble remover, but again, it’s not necessary to sterilize it. (2) Taking the bands off before storing the jars will allow any jar that might begin to lose it’s seal to be found easily. If the seal loosens, the lid would bulge and food inside would probably begin to ooze out over a period of time. It’s just an old habit and not required, but I like the thought process behind doing it. (3) Most of the time the jam turns out to be of good consistency. It will vary from one batch to the next, probably based more on the cooking time than anything else. Overcooking the jam will cause it to solidify more, so be sure to watch for that. 1) In fact, even pre-sterilizing the jars is unnecessary. They should be clean, of course, and hot. Not necessarily boiling hot, but hot, because that reduced the thermal shock of pouring in the jam. 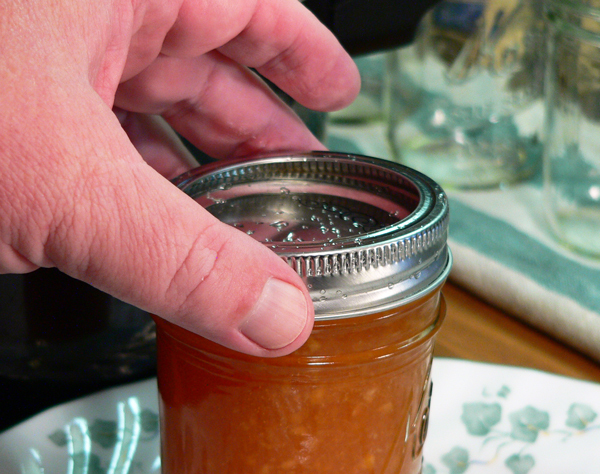 If you pour the jam into a cold jar, it could cause it to shatter. (I always fill jars on a tray with sides so if the jar does crack, the contents don’t spill all over the stove or counter. It’s happened once or twice.) But sterilization is exactly what the purpose of putting the filled jars in the water is for. The contents need to be held at or above 160º F for about five minutes, so the jars will be sterilized along with the food. Jam, unlike, say, whole peaches, is sterilized (aka pasteurized) before it enters the jar, so it doesn’t have to be in the water bath very long, but the inside of even a room-temperature jar will be well past 160 in just a few seconds after the jam is added, so pre-sterilizing is irrelevant. 2) Leaving the bands on after the jam is cool is not good for another reason: if the jars are exposed to damp during storage, the band can rust, making it very hard to remove. Since there’s no *benefit* to leaving them on, taking them off also means they’re available for your next batch of canning. 3) Peaches, like most fruit, have pectin in them naturally. Apples tend to have the most, berries have very little, peaches are in the middle. That’s why peach jam sets up without added pectin. But, how *much* pectin is in a peach varies from one variety to the next, on what the growing season was like, and when they were harvested. So it’s no surprise that different batches of jam will set up differently. Pectin actually gels because it reacts with the sugar. I’ll note that Sure-Jell’s peach jam recipe uses about 50% less sugar than yours, probably because theirs (obviously) includes pectin, so you wouldn’t need as much sugar in order to have enough pectin and sugar react to set the jam. Since yours uses only the naturally available pectin, making sure every last bit of it reacts with some sugar is part of what helps make it set, along with cooking it longer to give the reaction more time to occur, and boiling off some of the water to make it thicker. I have made several batches of peach jam, and will let you in on a little secret: I don’t bother with peeling the peaches! Never noticed a difference, especially if you use the processor to chop them up. Be warned, I also use “jam quality” peaches for jam. They don’t look as pretty, and may have some spots that need to be discarded, but they make excellent jam. I remember back when I was young and we had a peach tree in the yard, the peaches we used for jam were largely the windfalls, where I had to carefully avoid the bees and wasps as I was picking them up. Do you ever eliminate the added water and macerate the fruit and lemon juice in sugar overnight? This is a most fantastic recipe! I’ve started canning for the first time this year and find that your instructions are very detailed and thorough AND easy to follow – thank you! PLUS the recipes are delicious! I grew up with canned produce/berries my grandma used to make way back when in Russia and have missed the taste so much – those store canned products just don’t do it for me. So, 20 years later, I’m ready to try my hand at it! I’ll for sure check out your other berry canning recipes! On another note, do you have any less-sugar recipes or sugar free recipes that I can try my hand at for my diabetic family members? Hi Yelena, I understand the desire and need for less sugar, and I’m sorry that I haven’t posted any recipes to that extent. One of my friends at the local Extension Service office says the best thing she can suggest, is that you make the recipe using the sugar, just don’t eat very much of it at one time. She always says a little bit of the real stuff is much better than a whole bunch of the sugar free jam anytime. Great recipe! Well written with great details and seems easy to follow. Just one question, at the end you say to remove the bands, I’m confused, don’t you leave them on for storage? how long after canning peaches can you eat them? Found your site this morning (we are trying your pulled pork recipe and it’s in the refrigerator as I write)and I have to say, your recipes are wonderfully written and the step by step illustrations are fabulous! I am definitely going to try this Peach jam in late summer when there are ripe Peaches around. I had one question, I’m really trying to reduce my sugar intake. Do you think if the Peaches are very ripe I may not need sugar? And perhaps making my own pectin would help thicken it? I’m not sure what the relationship is between sugar and pectin, but it seems to me that every recipe I’ve seen has to have both. Hi Vicki, Thank you for stopping by and thank you for your question. You can make the Peach Jam with little or no sugar, depending on your needs and desires. In order to be safe, you need to find a specific recipe for what you intend to make, and that recipe needs to come from a trusted source. I highly suggest the Ball Blue Book Guide to Preserving, as its my go to source for the recipes that I feature here on Taste of Southern. Pectin is a natural and safe substance used to help your jams and jellies “gel” better. It’s a natural extract of apples and can be purchased or made at home. Both Ball and Pomona produce excellent pectin products for your use. The very ripe peaches you ask about, will have lost some of their “natural” pectin as the fruit ripens. Therefore, it’s suggested that a combination of ripe and not so ripe fruits be used when canning jams and jellies. Sugar is just the added sweetener for your jams, and again, the amount used may be variable, but you need to use an approved recipe for making the exact types of jams or jellies that you prefer. The ingredients, cooking times, and processing times could vary if you do something other than what is listed in this particular recipe. The canning and jarring process would be pretty much the same, but the time in the water bath might need to be extended. It’s a lot more than we can cover here in the comment section. I do hope this quick reply might help, and again, be sure to use an approved recipe to make sure your efforts come out right and safe. Perhaps there is a Cooperative Extension Service in your area that can provide some additional help. That’s why I always try to add a disclaimer to my canning recipes. I just submit them as a guide to how it’s done, to hopefully encourage you to try it out. Hi Carrie, Thank you so much for your comments on our Peach Jam. You have certainly made my day. Can you see me smiling? I think it’s awesome that you’ve decided to start doing some canning and I trust you will continue the efforts. It sounds like you’re off to a great start if you’ve used up 100lbs of Pears this year. I’m not sure what happened around my area. For the past several years folks have offered me pears and then this year… nothing. I know we had a lot of rain, which is a good thing, but the folks that I know with pear trees just didn’t seem to have any pears this year. Perhaps next year will be better. I’m just glad to hear that you have them in abundance and have put them to good use. I’m also sorry that I haven’t yet posted a pear recipe here on Taste of Southern. May I suggest you check out the Ball Blue Book Guide to Preserving. They have a recipe for Pear Preserves that doesn’t use pectin that you will probably like. They also have a jam recipe but it calls for pectin. Thank you for the recipe. I made 41 jars of the peach jam a few weeks ago. It took a while to cook down but the taste is great. I did not use a canner though – I never do with jam/jellies. Even without the canning the jam lasts several years. I just finished up some three year old blackbery jelly and it tasted like on the first day. 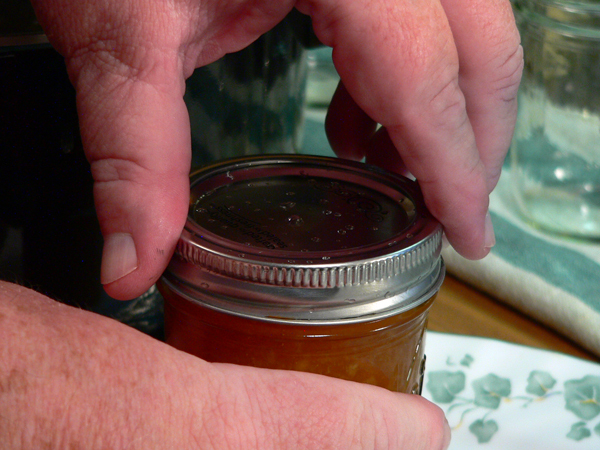 I had two jars out of 60 that had a mold spot on top when opened- I guess you would’t get that with a canner. Yesterday I tried to do red plum jam without pectin but I ended up adding a little after it boilt down so much and didn’t set. I only added a fraction of what was called for because I don’t care for hard jams. I would have preferred not to use the pectin. Thank you again! Hi Nadia, WOW…41 jars. My hat is off to you for making all that jam. That’s awesome. I’d just be too tired to do anything else for a few weeks. I’ve never tried the plum jam, but it sounds pretty good. I use to really enjoy eating plums from a tree that was in our backyard when I was a kid. They were small one’s and nothing like those great big things you find in the store these days. I loved ur article! I just sent my daughter to the store to buy pectin. It’s been a few years! OUCH!!! $3.69 a package! I’ve decided to try ur recipe! (happily!) anyway thanks for ur help. Hi Steve. Thanks so much for this recipe. First time making a jam, although my Turkish mother used to make a butternut squash dessert every Thanksgiving where she basically simmered the cut up squash in sugar for several hours and then served it at room temperature topped with chopped walnuts. I figure that’s almost a jam-like recipe. Anyway, I’m in Bogota right now (altitude ~7,000ft.) and the peaches are slowly simmering. I’m not going to put them in mason jars. I figure we’ll finish the jam within several weeks, and it should be okay refrigerated. But the pictures were very helpful in not making the task so intimidating. Thanks again. Gotta go stir! • In most cases, nectarines may be substituted for peaches in equal measure. Thank you for these exceedingly thorough directions! Quesiton: how long do you cook your peaches to get to the gel stage? For the second year in a row I’ve failed to get my peach jam to set. I believe my problem is that I have not been able to get my peach mixture up to the gel point (220 degrees at my elevation). The temperature hovered at about 216 for ten or more minutes yesterday, then the mixture started to burn so I gave up. Any advice on how to get that temp higher? Thank you! Hi Deb, Thank you for taking the time to share your comments and your results with making Peach Jam. I’m just sorry to hear that you haven’t been able to get your jam to gel properly. But, don’t give up on it, you’ll get it eventually. There really isn’t a way to give a set time on reaching the gelling point. You’re basically cooking moisture out of the mixture until it reaches that point. So, depending on the water content you begin with, cooking temp, etc., there are just a lot of variables to making the jam gel. It all just has to come together and if you’ll keep trying, eventually it will. Hello Steve, Recently, my neighbor gave us a jar of homemade peach jam and we fell in love with it. My 4 yr-old daughter and I couldn’t wait on our neighbor to show us how to make and can it. And, this morning on our way to church, one of the farms near our home had a table of free peaches. It was a sign. I am so thrilled to have found your website and recipe. I’ve never canned and I’m very excited to try. I’ll let you know how we do. Hello, enjoyed this method for the peaches, but did I miss something, I didn’t see the quantities. Thank you. I have some on the stove just now, will let you know how they turn out. I just guess some quantities. Thank you so much for sharing your recipe. I have a peach tree that was very bountiful this year and looking forward to trying this recipe today. My question is, could I also use this pectin free recipe on apples? I love the fact that this pectin free recipe has a lot less sugar then the pectin ones. Thanks again for sharing! Hi Jeannie, How blessed you are to have your own peach tree providing all those peaches! You can make Apple Jelly using a very similar recipe as this and without using pectin. Apples are very high in pectin and pectin itself is often made from apples. You can even find recipes for making your own pectin from apples if you’ll search it out. I suggest you consult this guide for making your Apple Jelly without pectin. 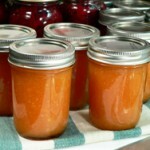 http://nchfp.uga.edu/how/can_07/jelly_without_pectin.html You’ll find lots more useful information as opposed to just trying to adapt this Peach Jam recipe to Apples. Dear Steve, I did my first ever peach jam following your steps, unfortunately my jam is a little too runny for my liking. I’m not sure, I might have not recognized the jellying point and started canning too soon. I’m a little disappointed with my results. I’m thinking to open my jars and reboil it all, would that be something that could help? I thank you for your input and recipes posted here online. It was a good learning experience. Thank you. Hi Vea, I’m sorry you didn’t get the results you were expecting with the jam. Don’t give up on it just yet though. Sometimes, it can take a week or two for a jam to set up correctly. Unless its just really watery looking, I’d give it a bit more time. As long as the jars are sealed, the product inside will be safe. If it doesn’t seem to be getting any thicker in a few days you could indeed open the jars and boil it some more. Maybe even try just doing half of it again to see if it comes out any better. Just remember that you MUST use NEW lids though. The bands will be OK to reuse but not the lids. Also, if you do boil it again, add about 2 Tablespoons of bottled lemon juice to the pot for each quart of jam you have, as you start the boiling process. Cook it until you can test it again for doneness and then remove it from the heat. 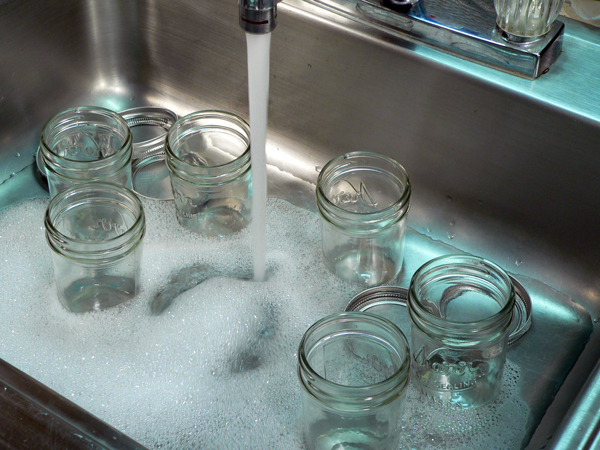 Skim off any foam, if there is any, fill the jars and process them again as you did before. Even if you decide not to redo it, you still have a product that you can use. It may be more like a syrup and would be great as a topping for Ice Cream, Pancakes, or Waffles. Lots of ways to use it. So, all is not lost. 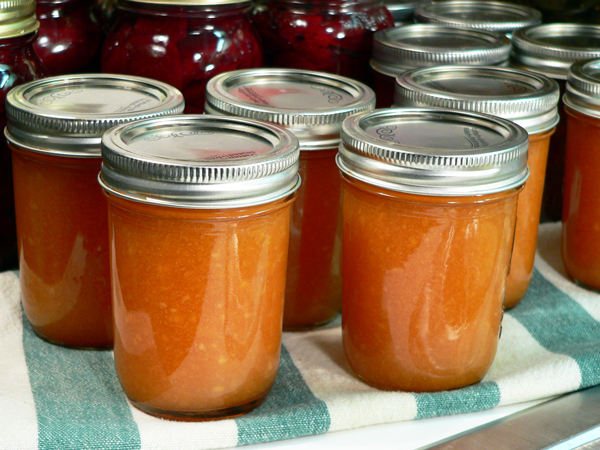 Canning and preserving fruits and vegetables is always a learning process. We learn through trial and error. I’ve certainly had my fair share of things to go wrong so don’t give up. Hang in there and try it again. You can do it. Thank you for trying the recipe. I’ll look forward to hearing how the next batch turns out for you. If you continue to have problems, you might prefer using a pectin product in future batches of jams and jellies. I was happy to find your recipe for pectin free peach jam. Now to figure out how many pounds of peaches I really have. Also do you know much about quince, or using it instead of pectin in making jams? A neighbor of ours has a quince tree but they probably won’t be ripe until the fall. I’ll let you know how the peach jam comes out. Thanks for the recipe. Getting back with you on my try for the peach jam using your recipe. Well, what can I say………….success! I took a sample to my job, Sunday, and had a co-worker taste it. I also had baked some homemade biscuits, since I knew that presentation was everything. I warmed up a biscuit, put a pat of butter on it, spread a little peach jam on it, offered it to my co-worker and all she could do was swoon. She said she wanted two jars for herself. I knew your recipe was a keeper as soon as I Googled for recipes and was blessed to find your site. Peach season is in full swing here, and I will be buying more peaches while I can to use your great recipe. I cannot wait until next year, when I can put up even more preserves during peach season. I did more than just give my friend a jar. I arranged small pieces of pretty orange fabric to put under the bands; wrapped each jar in newspaper for protection; put newspaper on the bottom of a bag with handles, and covered everything with tissue wrap paper. It was such a sight to behold and I must say, I was proud of the job I had done. Much of it in thanks to you, Steve. I will bookmark your site and I will try not to be a stranger in visiting. Here’s to more canning and preserving! Have a wonderful and happy year, Steve. Hi, Steve, thank you for your help on and making this so much easier than other recipes. But I do have a few questions about this recipe that I was kind of confused about. How many peaches do you use for this recipe, and how much sugar and lemon juice do you use to go along with that? Like Jennifer, I very rarely leave comments on any website, but your recipe had me smiling ( in recognition and appreciation) for how well thought out and informative it was. I co-sign everything that she wrote. Yes, it is very important to place the hot jars on a dry towel, since glass jars that are heated to high temps work under the same principle as Pyrex cookware. I especially liked that you dissolved the sugar in water to keep crystallization from occurring. Your recipe and the steps you take your readers through to make peach jam is definitely a winner. I have been making strawberry jam for the last three months, and through time, effort, and practice have what many (at least that is what they tell me), to be the best tasting strawberry jam they have ever eaten. Now, I am working on perfecting a good peach jam/preserve. As of today, I have bought four pounds of peaches this morning and went back on the web to find a good and reliable peach jam recipe, and since I already have lemons and sugar, when the peaches ripen I will definitely use your recipe. It is one of the best I have seen on the Internet. When I complete my peach jam, I will be sure to get back with you on how it came out and how everyone (my little ‘guinea pigs’ – family, co-workers) rated it. Hi, Steve. I rarely ever comment online, but half way through your post, I knew I had to. 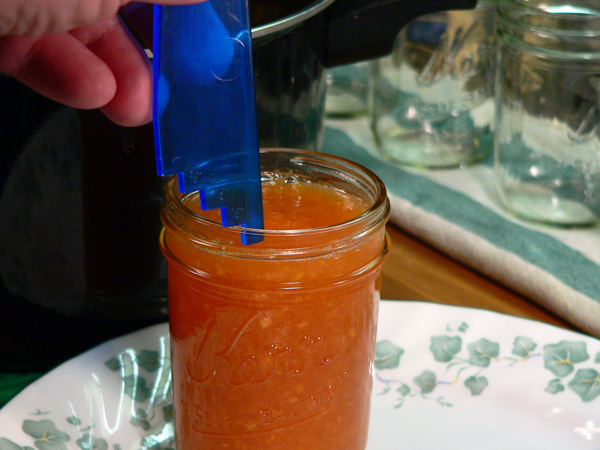 This was a fantastic, thorough- but not boring, introduction to canning and making peach jam. This summer was my first experience canning and it was just like you said, fairly traumatic at first, but it got easier and became more fluid. And the taste of homemade jam is unparalleled. I wish I had your recipe and post to begin with. The number and the quality of the pictures was helpful and I especially appreciated the way you explained the reason why we do some of the less obvious things, like placing the hot jars on a towel. Your direction to warm the lids vs. boiling them also clears up a lot of conflicting advice out there. Thanks again!